Now that we are a month into the school year, I thought it was time to give you an update. Elijah loves Kindergarten. He has had a few homework assignments, which he felt were not long enough. Slow down kid! You have years ahead to be saddled with too much homework. He’s made a few friends in his class, Bram & Cassie. I think last Friday was his best day ever, it was picture day, he got to buy popcorn and he was chosen to take home the class teddy bear, Bubba. In turn, we had to do something fun with Bubba and write about it in the Bubba book. We went to Color Me Mine and painted. Miles has since changed his “school is a little bit dumb” attitude, and isn’t complaining anymore. He is thrilled when he gets chosen to be the line leader, and loves playground time. He will be working with the class speech therapist to correct his pronunciation, and I’m waiting to hear back from the school district about how we can make sure he’s seeing her more regularly. Right now, he only sees her twice a month. With all the work & art they are bringing home I’m going to need another office box to store them in. I’m curious what other parents do with all the school work brought home. Do you save it? Do you scrapbook it? Let me know. We had such a wonderful time at the Robbie Burns Supper in January, we were keen on further embracing our Scottish roots and attending more Scottish events. After all, when Geoff & I were married, he wore a kilt. So he got decked out in his Armstrong tartan, I donned my Armstrong scarf and we drove up to Estes Park to check out the Longs Peak Scottish-Irish Highland Festival. 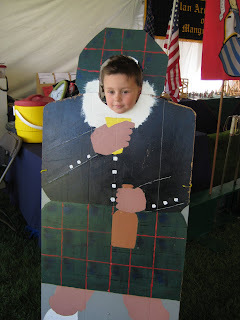 There are many celtic festivals held over the summer, but we seemed to miss them. This one happen to fall on a free weekend for us, so we jumped at the chance to go. You can buy your tickets in advance, and if you do, you will save some money. We did not, but we only needed to pay for three tickets (plus parking). It’s a pretty organized event, and has been going on for 30+ years. Aside from the clan tents, there are also scheduled events like jousting, caber tossing, dog agility. We saw none of those. What we did do was start at the Armstrong booth, have Elijah & Miles pick up passports, and let them run from booth to booth collecting stamps from the different clans. They thought this was awesome. 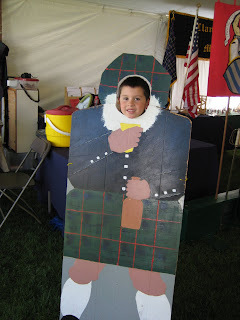 We stopped extra long at Clan Cummins to see the Kellys, who represent their clan at all the festivals. When we needed to dine, we visited the row of food stalls. The selections included fish & chips, haggis, bangers, deep fried Mars bar (which I wish I had tried) and meatballs on a stick. What I wanted was a hamburger, but those were nowhere to be found. I ended up picking a brisket sandwich that came with potato salad & beans. It was the shortest line, and it moved quickly. In the end we decided that the kids are still a little too young & wild to spend the day exploring a festival like this. And for the price we paid, it probably wasn’t worthwhile. We would have liked to see more, but it will have to wait for the future. We may have better luck at Tartan Day, which is celebrated in April, in Olde Town Arvada. Now I just need to get my little Scots an Armstrong button, or a tam.